Testimonial from Laurie and Al H.
Sam – just a note to thank you for your outstanding effort in selling our home. Your dedication, professionalism and unparalleled personal attention made the process feel so effortless for Laurie and me. Over the years, we have had numerous experiences with multiple real estate agents throughout six different states. Although we’ve dealt with some great agents and had some extremely smooth transactions, you provided us with a far better experience than we had ever received or could have ever imagined. I am always very hesitant to recommend someone for almost anything but it is with firm conviction, that I would highly recommend you to anyone who is considering buying or selling a home. Great job, well done Sam! New testimonial from Jim and Twyla – Thank you! New testimonial from Bob and Iva – Thank you! New Testimonial from Bill and Betty – Thank you! New Testimonial from Gene and Linda – Thank you! My name is Debra and I was referred to Sam Inman to list my home in Post Falls, Idaho. It was a very stressful time in my life but she was great. She came to my home and took listing. Before it even hit the MLS I had a showing. She scheduled a photographer to take pictures and my home sold in one day. I was very impressed because I was expecting it to take at least a month to sell.. Needless to say I had to pack in a hurry. She is excellent to work with and kept me posted on everything that was happening. I would recommend anyone trying to sell or buy a home to try her out. I can not thank her enough for the excellent work. When my husband and I decided to sell our home,we knew we needed not just a real estate agent, but a true professional with experience. We had a house with property that we realized would require the exposure to attract the right buyer. After meeting Sam Inman we knew she was definitely up to the task. She was relentless in advertising our home, which exposed it to the masses, until the right buyer found it. 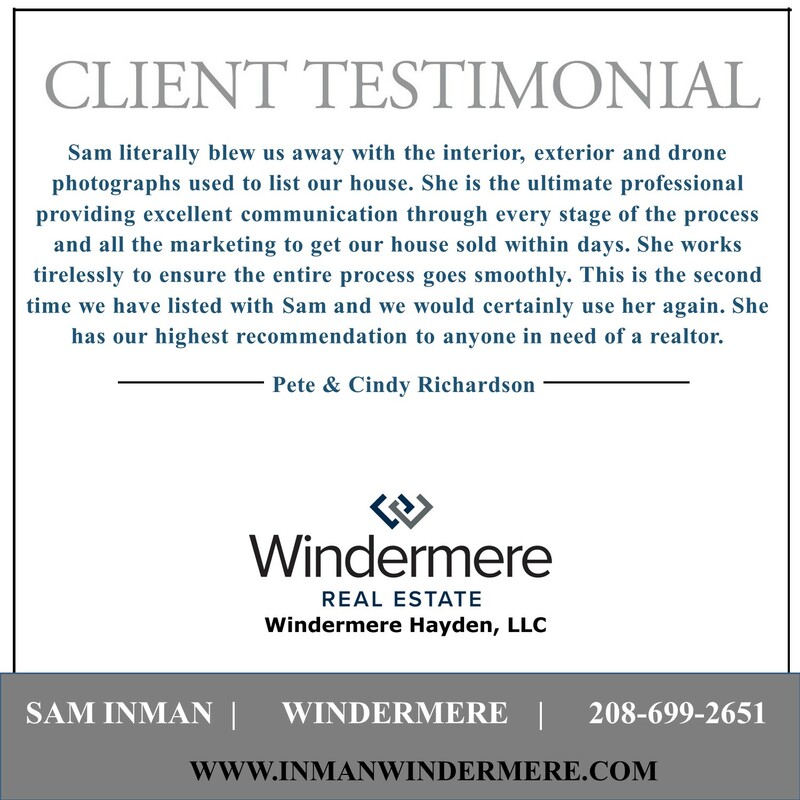 When there were bumps in the road, which there always are with buying and selling, Sam handled it all like the professional she is. What was very important to us as well was her honesty, not only with us but with the other agents clients. After closing on our home, she never gave up until we were in the exact location we wanted to be. I will always recommend Sam, given the opportunity, because of the trust I have in her as a real estate agent. 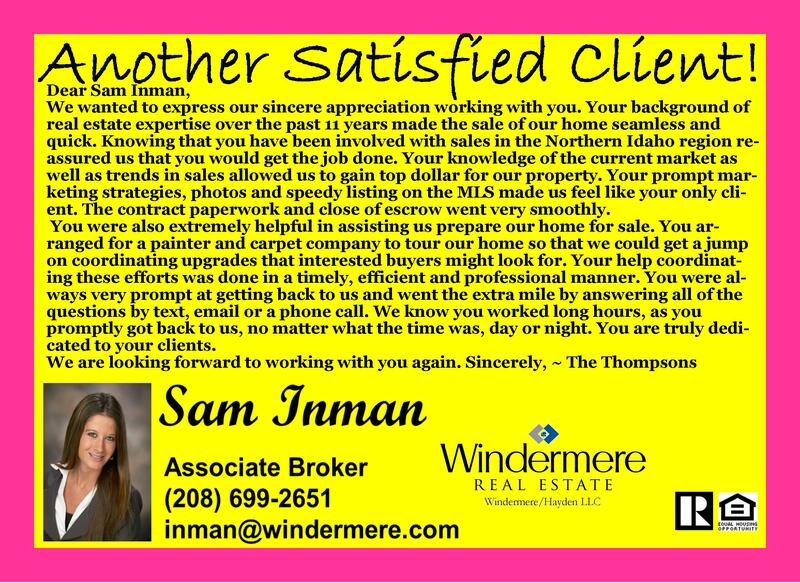 Sam Inman sold my home in Post Falls and I have worked with many agents and sold many homes over the years. This was by far the most pleasant experience. I felt confident that I got excellent market exposure for my home. Sam kept me informed about the progress, updating me on showings and feedback and when it did sell she was very helpful in reviewing the purchase offer. Sam responded quickly to my questions and even when she took a brief vacation she made sure someone covered for her. I highly recommend Sam as a selling agent.